MadgeTech, together with Pimzos, is rolling out the new MadgeTech Cloud Services Basic to help data logging clients of the Netherlands manage and monitor data remotely from wherever they are. In this age of technology where the needs are critical and everything is "on demand", Pimzos is offering a wide range of data logging solutions to accommodate the smallest of operations or large scale facilities with multiple locations. Pimzos is dedicated to providing innovative monitoring equipment that meets the highest regulatory standards, making them the premier distributor of MadgeTech products in The Netherlands region. This includes products that are CE approved for the European market, and MadgeTech’s state-of-the-art 2000A wireless data logging series, which has become the latest standard for an array of industries. Now, with the newly released RFC1000 Cloud Relay, there is no need for a computer. This data logging hub transmits real-time data from wireless data loggers directly to the MadgeTech Cloud using a built in Ethernet connection for internet access. MadgeTech's wide selection of wireless data loggers combined with the MadgeTech Cloud Services deliver a system that is affordable, scalable and easy to use, offering the ability to view data remotely from anywhere on any smartphone or tablet. Pimzos delivers an assortment of MadgeTech products including a device that offers the perfect solution for egg processors to ensure the quality of the product from farm to table. Under Dutch quality regulations, all eggs are stamped with a code to trace them back to where they came from. With a large majority of egg products in The Netherlands being exported, MadgeTech’s EggTemp data logger is ideal for monitoring the lengthy journey of the eggs in transit and records what they experience. The EggTemp's egg-like shape responds to the environment in the same way a real egg does. This provides a complete environmental overview of what the actual eggs are exposed to during shipping and storage. For businesses who rely upon the shipping and transportation of sensitive material, Pimzos also offers the MadgeTech series of shock data loggers. The battery powered Shock101 is ideal for monitoring the environment inside of moving vehicles, trucks, containers and ships. Monitoring the shock and vibration of items in transit provides peace of mind for the shipper in knowing that products were handled properly and arrived safely, or identifies areas of risk that may need to be adjusted. MadgeTech is proud to partner with Pimzos, who has been serving The Netherlands and Europe since 2010. Pimzos complies with all standards and assures their clients receive quality products and continued support. 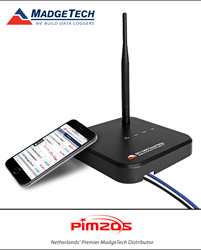 To see the entire line of MadgeTech products available contact Pimzos directly.